Researchers report that existing redox active compounds, like vitamin C, can sensitize cancer cells to radiation and chemotherapy. Researchers at the University of Iowa discovered a metabolic frailty in cancer cells that is based on cancer cells’ production of oxidizing agents. Pathways that alter iron metabolism in cancer cells but not normal cells appear to lead to increased sensitivity to high doses of vitamin C, resulting in cancer cell death. In this study, the researchers evaluated 11 patients enrolled in a brain cancer safety trial. Each patient received 3 infusions of vitamin C per week for 2 months followed by 2 infusions per week for 7 months while receiving standard care of radiation and chemotherapy. 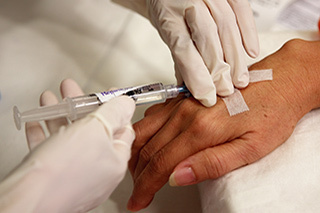 The goal of each infusion was to increase the concentration of vitamin C in the patient’s blood from the level found in most adults (approximately 70 µM) to 20,000 μM. The high dose is necessary because vitamin C has a half-life of approximately 2 hours in blood circulation in humans. The treatment was generally well tolerated, with modest side effects, such as frequent urination and dry mouth. Some patients developed hypertension that quickly subsided following infusion. 2. High doses of vitamin C to improve cancer treatment passes human safety trial. New York, NY: Cell Press; March 30, 2017. https://www.eurekalert.org/emb_releases/2017-03/cp-hdo032317.php. Accessed April 6, 2017.